While testing my new mission, somebody mentioned that in real life platoon commanders give their sections orders to be executed based on specific conditions being met. The rationale is that when the fight starts, communications get very intense and is not infrequent to not be able to issue orders because of all the radio traffic and general confusion. My mission has been described as "an unruly mess of useless engagement areas". It nonetheless turned out to be quite an ice breaker to get talking. This is the tactical situation at the start of the mission. 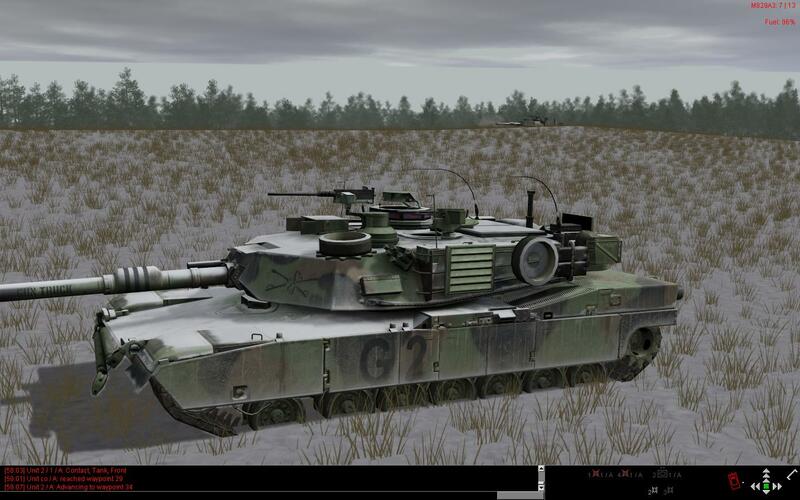 But here is what the fellow with real life experience said (I'm paraphrasing): "right before the mission start, some company and platoon commanders prefer to tell their subordinate formations to orient onto one EA or another based on the amount of enemy tanks/IFVs reported on them". This allows the subordinate units to act quickly if the conditions are met, regardless if their commanders can reach them or not. Right click and open in a new tab or window for a better view. It is quite neat that Steel Beasts ProPE allows something like that. Given all the engagement areas and the uncertainty of which avenue of approach the enemy will use, one could add a conditional route. 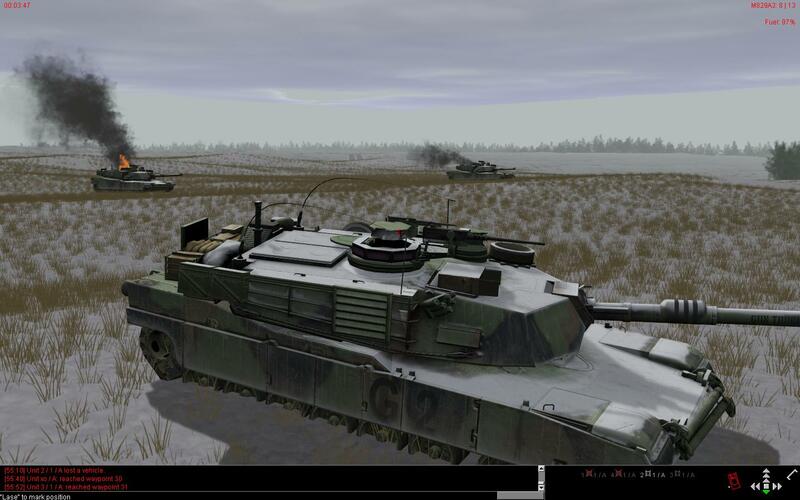 In this screenshot, 2nd Platoon is ordered to move onto a battle position if more than 3 enemy tanks are observed. Unfortunately, conditional routes can't be created once the mission starts. This would reduce the involvement and rush clicking for the player in solo scenarios. The mission was quite exciting. At least to me. But I guess it has to go back to the design board. So you are shooting into the EA but I see two burning friendly tanks!? LOL. Lots went amiss with the plan, barely short of friendly fire. I saw that thread and I liked the way you enfiladed your fires, with your weapons in nice defiles. That's what I could not do in this scenario. The first thing that struck me is that your tanks are too far away from the engagement areas. That is a particular problem with EA ELLICOT -- if you don't get timely warning from your scouts, or the M1s are delayed on the way to their firing positions, you may well end up transiting through BALTIMORE under fire from the ENY! You'd have been better off putting the tanks in hide positions 500m east of BP12. From there, they could move in a timely fashi0n (notwithstanding the woods)to the BO overlooking ELLICOT or BPs 12 & 13, depending on what the scouts report. The second thing, as Col. Gibson noted, is that your firing positions are sited to for frontal engagements; you want to hit from the flanks if at all possible. 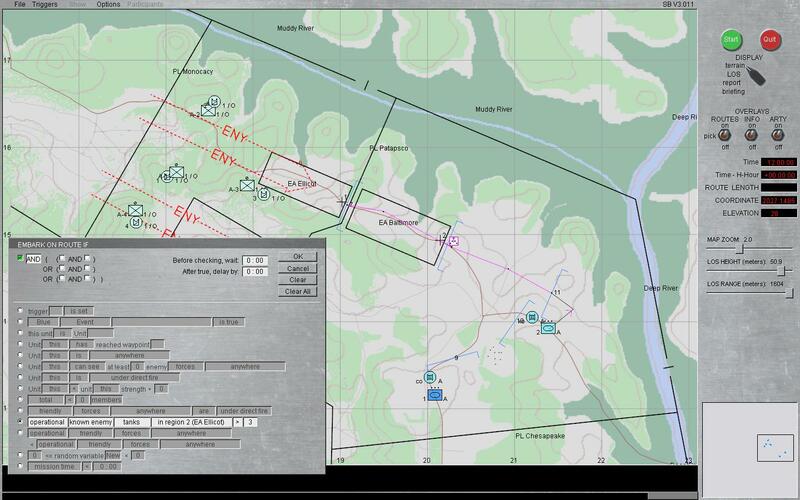 Maybe position one of your platoons in the woods between ELLICOT and COLUMBIA, with alternate BPs looking into each EA. Note, though, that due to the restricted terrain, these engagements are going to be at point blank anyway. Difficult to get the first shot(s) in and disengage. About EA Ellicot and tanks getting there through EA Baltimore: all the terrain in EA Baltimore has no LOS to EA Ellicot. The problem of getting in time at a the BP overlooking EA Ellicot stands, though. 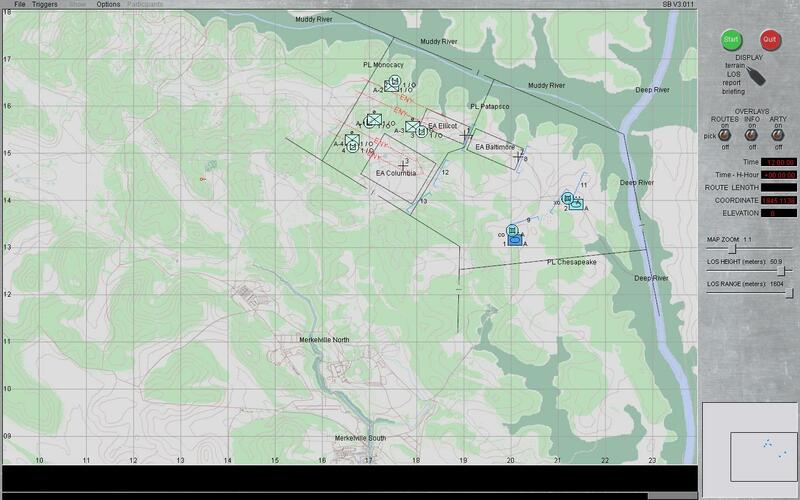 I played this scenario last night and now that you mentioned the observation posts, they were useless to detect the Russian recon parties. Which forced me to detach some tanks and place them into advanced positions. Quite a mess! Is there an interest in an AAR? The mission will be up at SteelBeasts.com after it gets approvals. Yeah, I can see from the map that there is no LOS from BPs 10-11 into ELLICOT. Unless the scenario does not permit redeployment of the M1s during the Planning Phase, you should definitely reposition them. BTW, I see that you're in the US Eastern time zone. You should consider joining the weekly online game hosted by the guys at the steelbeasts.com website. 10pm EST every Friday. Very informal gameplay, mature crowd (no taunting, etc. ), no prior commitment required (unless you volunteer to command a particular side), and you don't need to be particularly skilled (sure, I can critique a plan from the sidelines, but my tanking skills are middling at best). There is no comparison between AI and a live human adversary (or teammate). Been there last night but could not connect. This port forwarding thing drives me nuts sometimes. Have you been able to connect at all previously? If so, that's a good sign. For some people's ISP situations, port forwarding is not an option at all. I know little about the subject, but I encourage you to ask for assistance in the support forum at the SB website. I'm sure someone will be able to get you connected if it is at all possible given your network situation. Ahh, downloaded this from SB.com this AM, and played it,(didn't know it was this mission you posted about till now), I thought, first run through it was pretty well done, not overly complicated but not a cake walk. Don't know how the enemy tanks got through without my recon units up front reporting them thou. But the tank battles itself was pretty cool. Hey JC! Grabbed this yesterday without realizing at the time that it was the mission you'd just blogged about. Gave it a run through and posted about it over at Cry Havoc! Great fun. I ran into the same issues with the scouts and location of the BPs. My stunning defeat was entirely due to my poor command skills however! I have to admit that after watching a video from BG ANZAC I'm getting tempted to try MP. I usually avoid it like the plague. It seems like SB Pro attracts a different crowd, though. They are looking at a "patch" (i.e. free as opposed to a paid upgrade) some where around June that effectively removes the need for "port forwarding" by clients. Only the "server" needs that setup and people who offer to run 'servers" tend to have already cracked this nut. "It seems like SB Pro attracts a different crowd"
I don't want to appear snobbish but yes the players tend to be more "mature" (either in age or approach) - perhaps a hidden advantage of the price barrier that existed up until 3.0XX. Not a lot of the types you see on say WoT or other "free" MP outlets (or so I'm told as I avoid WoT like the plague). Doug, the MP experience with SB is rather different than most other online games. A minimum of the juvenile #$%@ you find elsewhere; generally, respectful people and good sportsmanship. Might I suggest giving it a try to see for yourself? The "TGIF" game hosted by the steelbeasts.com guys takes place at 10 PM US EDT (which is 2 AM Saturday in UTC) almost every Friday. You can get the Teamspeak server address on the steelbeasts.com website. If you haven't done the port-forwarding setup with your router, then I would suggest first going to the support forum on the website for some assistance. There is a new version coming a few months hence which will (mostly) dispense with the port-forwarding requirement, but we're stuck with it for now. Thanks Chuck and Doug for trying out the mission. I will be modifying it in the future. I also thank Mark and the men of the 3AD virtual unit for their help trying to get me on an online game. 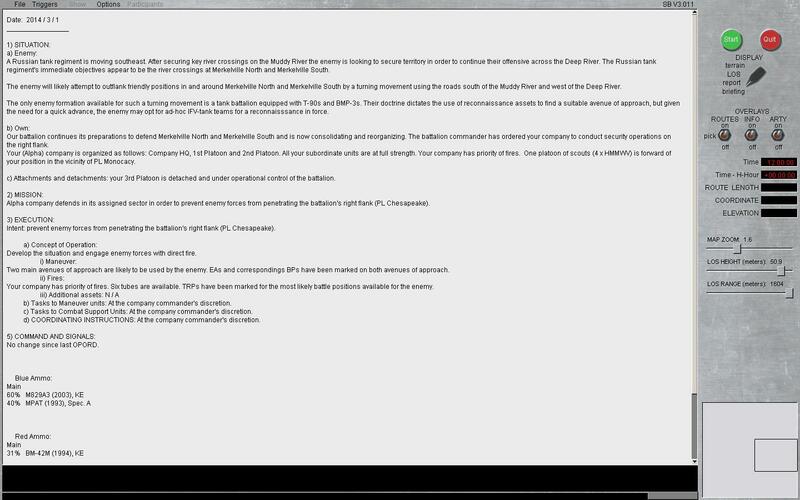 Alas, I can't get into a multiplayer game after following all the online instructions and their help. Good news about the port forwarding requirements not needed in a future upgrade. Oh did you try the Hamachi option? I don't see record of you connecting to my machine. Tried the Hamachi with one of the regulars of the blog. It slows down the game too much for us. Thanks LL, I may give it a try this Friday. I can see where playing with humans in this case might really enhance the experience. I really did enjoy the mission, even if I got kicked to the curb! This was probably obvious, but you can find Rotar's videos by searching for that name on Y/T. Correction: his Y/T name is rotareneg. Thanks! Found the videos and I'll take a look. Most of this is in 2.654 (or perhaps earlier) so the Infantry look better now and some of the models are improved but the approach of the players in terms of radio traffic and tactical employment is pretty spot on. Not saying they are better than the others already referenced but are more good examples.